There are twelve steps up the mountain of pride. Think of these like escalating symptoms. Perhaps you think that AA invented the idea of the 12 Steps. If you should ever think that an idea is new, go back and see how the Greeks used it, or in this case, how the Medieval Latin scholars used it. 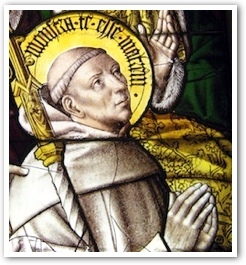 In the Twelfth Century, St. Bernard of Clairvaux identified twelve steps up the mountain of pride, and another twelve steps down. These are detailed in his work entitled Steps of Humility and Pride. In today's post, we focus on the twelve steps of pride. Next week, we will turn our attention to the twelve steps to greater humility. My intention is to point out some ways in which these twelve steps can be applied to our lives in the modern world. The 12 steps of pride grow more serious as we go along them and lead, ultimately, to the slavery of sin. Those steps tend to build on one another, beginning in the mind, moving to outward behavior, then deepening into an attitude of presumption, and ultimately revolt and a slavery to sin. For if one does not serve God, one will serve Satan. (1) Curiosity: There is such a thing as healthy curiosity. But curiosity can also lead to sin if we delve into things we should not, either because they are other people's private affairs or because they are not good for us to know. Curiosity becomes tainted with pride when we cast all caution aside, and with a certain indiscreet and privileged sense, we pry, meddle, and look into things we ought not as if we had a right to do so. This is sinful curiosity. (2) Levity of mind: The tendency to occupy the mind with inappropriate things can grow and lead to a tendency to become superficial in wider matters. Here, too, there is certainly a valid sense of humor and a kind of recreational diversion that has a place in a balanced life. A little light banter about sports or pop culture is perfectly healthy and appropriate. But this can become all we do, and we may be tempted to cast aside matters about which we should be serious as we pursue only light and trivial things. Hours of watching sitcoms and "reality TV" but no time for prayer, instruction in the faith, and wider cultural things of beauty and truth shows a lack of seriousness. When we lightly brush aside what is important to God and substitute our own foolish and trivial interests, we act in pride. (3) Giddiness: With giddiness, we move from levity of mind to the frivolous behaviors produced by it, behaviors in which we routinely over-emphasize lightweight experiences and situations at the expense of more meaningful and godly things. We maximize the minimum and minimize the maximum. We find plenty of time for trivia, but little or no time for prayer, works of mercy, or the study of truth and the enjoyment of real beauty. Jesus is the standard we must meet. But rather than refer our self to Jesus and seek mercy, we refer our self to others we look down on and give way to pride. (4) Boasting: Increasingly locked into our little world of idle thinking and foolish behavior, we may begin to exult in banal activities and consider such behaviors to be a sign of greatness. We begin to boast of foolish things. The boaster thinks too highly of himself, and either claims qualities he does not really have, or forgets that what genuine good he does have is a grace and a gift. St. Paul says, "What have you that you have not received? And if you have received it, why do you boast as though you had not?" (1 Cor 4:7). Boasting springs from pride. (5) Singularity: Ironically, as our world contracts, we think ourselves ever greater. As our pride grows, we too easily forget our dependence on God and others for who and what we are. In truth, there is no such thing as a self-made man. We are all contingent beings, very dependent on God and others. Therefore, by relying only on our own counsel, we discount reality and stop seeking information and counsel from others. The man who seeks only his own counsel has a fool for an advisor, and a prideful advisor at that. Singularity springs from pride. (6) Self-conceit: Self-conceit means an unduly high opinion of our own abilities or worth. As our world gets ever smaller and our pride ever greater, our self-focus grows ever stronger and we become increasingly self-referential. A thing is now considered true merely because we say it is true. Similarly, we consider ourselves fine because we say we are fine. We deny that all of us are a mixture of strengths and weaknesses, sanctity and sinfulness. We find faults in others but fail to see them in ourselves. We compare ourselves to others whom we look down on and give way to pride. (7) Presumption: At this stage of pride, even God's judgments must cede to ours. This is a sin against the virtue of hope wherein we believe that salvation is due to us no matter how we live. The Theological Virtue of hope teaches us to ask with confidence for God's help in attaining eternal life. It is great pride to presume that we have already accomplished it and possess what we do not. (8) Self-justification: Jesus must now vacate the judgment seat because we demand to take his place. Not only that, but he must also vacate the cross because we do not really need his sacrifice. We think that we can save ourselves and frankly, we do not need a lot of saving. Self-justification is the attitude that says we are able, by our own power, to justify, that is, to save ourselves. It is also an attitude that says, in effect, "I will do what I want to do and I will decide if it is right or wrong." St. Paul says, "I do not even judge myself. My conscience is clear, but that does not make me innocent. It is the Lord who judges me" (1 Cor 4:3-4). Yet the prideful care only for their own point of view and refuse to be accountable ultimately even to God. The prideful person forgets that no one is his own judge. And thus we have climbed in twelve steps the mountain of pride. It begins in the mind with a lack of sobriety rooted in sinful curiosity and frivolous preoccupation. (9) Hypocritical confession: The word "hypocrite" in Greek means "actor." We may observe that, in certain settings, some degree of humility and acknowledgement of our faults is "profitable." We may see that we can get "credit" for humbly acknowledging our faults and calling ourselves sinners. But the prideful are just acting, just playing a role more for social credit than out of real contrition or repentance. We may believe that, after all, we are really not that bad. And if posturing and playing the role of the humble and contrite sinner will get us somewhere, then we will say our lines, play the part and look holy if the applause from the audience is forthcoming. (10) Revolt: Pride really begins to go off the rails when we openly revolt against God and his lawful representatives. To revolt means to renounce allegiance, accountability, or obedience to God, his Word or to His Church. It is prideful to refuse to be under lawful authority and act in ways that are directly contrary to what that authority rightly asserts. (11) Freedom to sin: Here pride reaches its near conclusion as it arrogantly asserts and celebrates that it is utterly free to do as it pleases. The prideful person increasingly rejects any restraints or limits. But the freedom of the prideful is not really freedom at all. Jesus says, "Whoever sins is a slave to sin," (John 8:34) and the Catechism echoes, "The more one does what is good, the freer one becomes. There is no true freedom except in the service of what is good and just. The choice to disobey and do evil is an abuse of freedom and leads to the slavery of sin" (Catechism 1733). But the prideful will have none of this and arrogantly go on asserting the freedom to do what they please, even as they descend deeper and deeper into addiction and slavery. And thus we have climbed in twelve steps the mountain of pride. It begins in the mind with a lack of sobriety rooted in sinful curiosity and frivolous preoccupation. Then follows frivolous behavior and excusing, and presumptive and dismissive attitudes. Last come outright revolt and slavery to sin. Pride is then in full flower. We have seen the escalation in these steps which illustrates an old admonition: sow a thought, reap a deed; sow a deed, reap a habit; sow a habit, reap a character, sow a character, reap a destiny. Is there a way down this mountain of pride? You can read the answer to that question in our next CERC bulletin as we explore "12 More Steps: Out of Pride and into Humility, from St. Bernard." Monsignor Charles Pope. "The Twelve Steps up the Mountain of Pride According to St. Bernard of Clairvaux." Archdiocese of Washington (March 19, 2013). Reprinted with permission from Monsignor Charles Pope. Monsignor Charles Pope is the pastor of Holy Comforter-St. Cyprian, a vibrant parish community in Washington, DC. A native of Chicago with a bachelor degree in computer science, his interest in the priesthood stemmed from his experience as a church musician. He attended Mount Saint Mary's Seminary and was ordained in 1989. A pastor since 2000, he also has led Bible studies in the U.S. Congress and at the White House in past years.